Lawrie Shabibi is pleased to present Kaaba Picture as a Misprint, a solo exhibition by Hamra Abbas. Kaaba Picture as a Misprint marks the return of the artist to the UAE following her award of the Abraaj Capital Art Prize in 2011 and the Jury Prize at Sharjah Biennial 9. Hamra Abbas’s vast artistic practice draws from a myriad of sources. Her works originate from encounters and experiences—an image, icon or gesture—that are manipulated by the artist transforming its scale, function or medium. Her intention is to deconstruct the act of seeing by recreating images that form part of a collective memory. Unrestrained by subject matter or media, she takes an investigative approach to produce a diverse and holistic body of work addressing notions of cultural history, sexuality, violence, ornamentation, devotion and faith. In her new body of works Abbas continues to explore the alternation of scale and medium but within the context of the visual language of devotion. Using the Kaaba as the starting point of her enquiry, her inspiration comes from a variety of sources that are associated with the sacred construction and the Hajj Pilgrimage. In “Kaaba Pictures” for instance (a series commissioned for and first exhibited at the deCordova Biennial, 2013), Abbas takes her cues from souvenirs that are bought by pilgrims during the Hajj pilgrimage. Often found within the private homes of her native Pakistan, these objects serve as a portable memory to the sacred ritual. Appropriated by the artist and transformed—from object to painting to large-scale photograph—the works begin to follow the format of the mass-produced images of their origin and are returned to the public for consumption. In “Kaaba Picture as a Misprint,” a series of six photographs and the namesake of the exhibition, Abbas takes the cubic form of the Kaaba to its most simple geometric representation: two black rectangles. 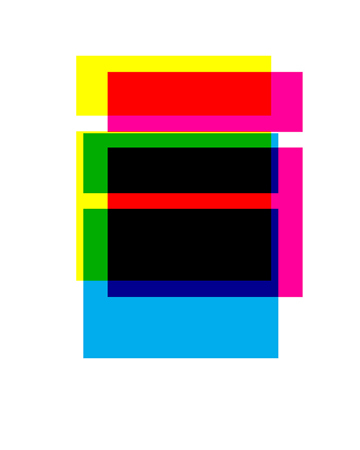 Through experimentation, the black form is broken down into cyan, magenta, and yellow versions of the shape, which are then printed off-centre. Through this technique, only when the three colours are layered upon each other is the image black. By deeming her method a “misprint,” the artist links the quest for truth through religious devotion to the plethora of ways in which that truth can be understood. In Kaaba Picture as a Misprint Abbas employs the visual language of religion and contemporary acts of devotion to address transformation and individual experience. It is an investigation about the ideas and ideals that are beyond medium and homogenized understanding; an invitation to a personal assignation of value and evocation of memory. A publication accompanies the exhibition with an essay by Justine Ludwig, independent curator and writer and Adjunct Curator at the Contemporary Arts Center Cincinnati, Ohio. Hamra Abbas received her BFA and MA in Visual Arts from the National College of Arts, Lahore in 1999 and 2002 respectively before going on to the Universitaet der Kuenste in Berlin in 2004, where she received the Meisterschueler. Abbas has exhibited in numerous solo exhibitions, most recently at Jhaveri Contemporary, Mumbai, India (2012); PILOT, Istanbul (2012); Canvas, Karachi, Pakistan (2012) and Green Cardamom, London (2011). She has taken part in group exhibitions at notable institutions and foundations, including Pacific Asia Museum, Pasadena, USA; Singapore Art Museum; Royal Ontario Museum, Toronto; Victoria & Albert Museum, London; Devi Art Foundation, Gurgaon, India; Asia Society Museum, New York; ARTIUM de Álava Vitoria-Gasteiz, Spain; Manchester Art Gallery, Manchester, UK; REDCAT, Los Angeles and most recently the Isabella Stewart Gardner Museum, Boston. She has also participated in the deCordova Biennial, Lincoln, USA (2013); Asian Art Biennial, Taichung, Taiwan (2011); the International Artists Workshop of Thessaloniki Biennial, Greece (2009); International Incheon Women Artists Biennale, Incheon, South Korea (2009); Sharjah Biennial 9, UAE (2009); Guangzou Triennial, China (2008); Istanbul Biennial (2007); the Biennale of Sydney (2006) and the Cetinje Biennial, Montenegro (2004). Her works are part of notable international public collections, including the Vanhaerents Art Collection, Brussels; Nelson-Atkins Museum of Art, Kansas, USA; Kadist Collection, Paris; British Museum, London; Devi Art Foundation, Gurgaon, India; Kiran Nader Museum of Art, New Delhi, India; Art In Embassies Collection, USA; Koç Foundation, Istanbul and Borusan Contemporary Art Collection, Istanbul. Abbas was born in Kuwait in 1976 and currently lives and works between Lahore and Boston. Lawrie Shabibi is a contemporary art gallery housed in a 3,000-square-foot warehouse in Dubai’s Alserkal Avenue. The gallery’s programme has been to support a multi-generation of international contemporary artists mainly from the Middle East, North Africa and South Asia. By holding a regular programme of exhibitions, screenings and talks, publishing catalogues and participating in international art fairs, the gallery engages the wider local and international community. The gallery represents Hamra Abbas, Wafaa Bilal, Asad Faulwell, Nadia Kaabi-Linke, Selma Gürübz, Nabil Nahas, Driss Ouadahi, Marwan Sahmarani, Larissa Sansour, Yasam Sasmazer, Shahpour Pouyan and Adeel uz Zafar.